James Dou, Chief Technology Officer at ChipCare. From the patient’s perspective, the way that blood tests work today is not very different from how they worked 30 years ago: a blood sample taken at a doctor’s office gets sent to a lab somewhere and then a week or so later the results return. Now, what if the entire lab could be put inside a device as simple as a cellphone that could process the same blood work in just 20 minutes using a single drop of blood? Not surprisingly, there is a whole area of research where software and hardware experts are working with chemists, biologists and engineers to put entire labs literally in the hands of care workers out in the field. ChipCare, a Toronto-based, MaRS-backed company, is at the cutting edge of lab-on-a-chip technology. “What we’ve been able to do is to take large technologies that are very expensive, bulky and finicky, and that need a lot of training and a lot of calibration, and with our core intellectual property, we’ve been able to miniaturize a similar process in a handheld device,” Fraser explains. 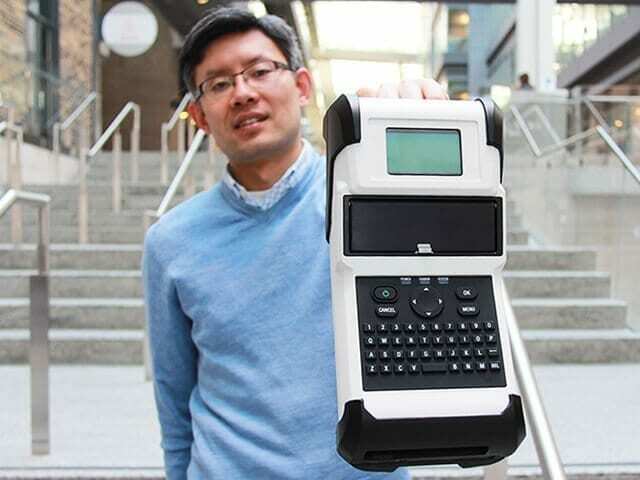 ChipCare’s first device, which targets HIV tests, will be seeking a CE marking certification this summer and will then move on to the World Health Organization pre-qualification process as part of The Global Fund’s Expert Review Panel for Diagnostics Products. The goal is to deploy the device in Sub-Saharan Africa, where 70% of the world’s HIV-positive individuals live. However, according to Fraser, ChipCare’s unique device can also be used for multiple classes of tests, including protein and molecular testing, which broadens its use from the HIV-AIDS crisis in Africa to dozens of other diseases. The device can be used anywhere without direct access to a 24-hour lab, including remote communities in Canada and the United States. 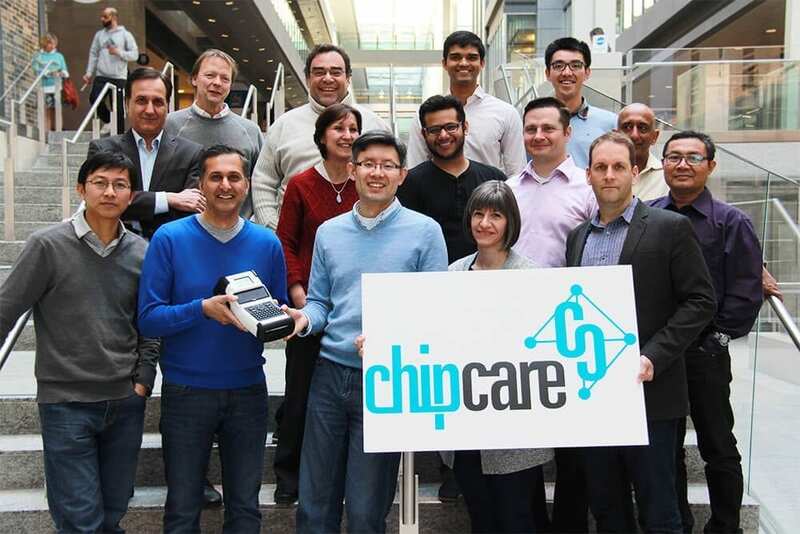 The complicated technology inside of the device is a result of the partnership between James Dou and Rakesh Nayyar, ChipCare’s chief technology officer and chief science officer, respectively. Dou was a PhD candidate at the University of Toronto when he met Nayyar, who was then heading the University Health Network’s Flow Cytometry Facility. 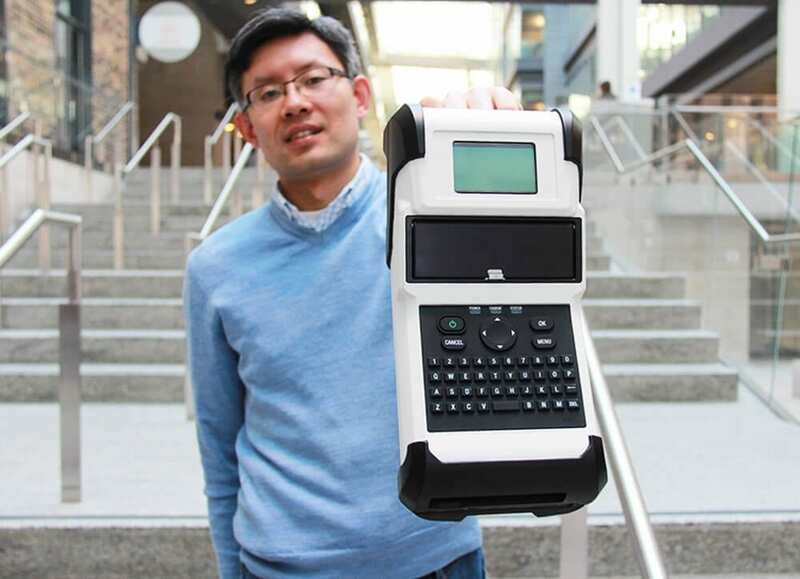 Dou credits the support he received at U of T—from everyone from his thesis advisor to the Innovations and Partnerships Office—as well as from the MaRS Venture Services team for the ability to get the technology off of the drawing board and into a device that’s almost ready for market. “It’s a collaboration between engineering and life sciences. My background is in applied physics, but now we’re doing biology in a medical device. It covers such a wide range of expertise and knowledge to put it together: it’s got electronics, the software, the hardware, the mechanics, the fluidics, the chemistry of the reagents,” explains Dou. “The fact is that here at MaRS, within the vicinity of this hub, you’ve got engineering, chemistry, mechanical and life science researchers all in close proximity. Now, there is something unique,” he says. For Dou, even raising the first round of seed financing was an eye-opener. “The negotiations, the legalities…everything. At that time, I didn’t know what it took to accomplish these things,” he says. Fraser warns that, even after securing some money, growing from a small startup to a real-world manufacturing line takes more than a group of scientists backed by capital. “As you grow as a company, you’ll soon need real specialists. You can’t be a scientist and also scale a manufacturing facility at the same time. It’s just a whole other world. You need to find the right people who have the skills to get you to the next level,” he says.